Monster Clean Power for Better Sound and Enhanced Picture Quality!!!! Monster is proud to unveil the newest model HTS 3600 PowerCenter: the HTS 3600 MKII Home Theater Reference PowerCenter. 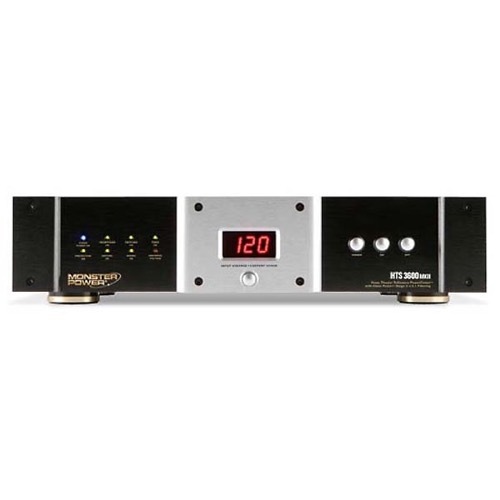 With Monster Clean Power Stage 3 advanced power conditioning, the HTS 3600 MKII offers a high level of component isolation and noise rejection for better picture and sound. And advanced Monster T2 and Tri-Mode protection technology provides unrivaled surge protection technology to help protect your valuable digital TV investments. Designed Specifically for Today's Home Theater Systems!!! The HTS 3600 MKII also features two easy-to-read digital LED meters with adjustable illumination showing either AC power draw or input voltage; AC in and DC in triggers that allow external control of the PowerCenter from AV components; and an extra-long 8 ft. PowerLine 100 Cable with 24k gold contacts and advanced shielding for outstanding power transfer and interference rejection. Full Surge Protection to Protect Your HD Investments!!! New MKII features include a higher joule rating, our patented, computer-controlled Monster T2 surge and voltage protection and surge-protected phone/network connections. All this, plus fire-resistant MOVs to further isolate surges for increased safety and component protection, make this Monster Power unit one of the world's safest and cleanest power management solutions available today. Monster Clean Power Stage 3 (v.2.0) Circuitry Filter Dramatically Reduces Electronic Noise. T2 Automatic Disconnect / Reconnect Protection Circuitry. Tri-Mode Power Protection Circuitry with Audible Alarm and Auto Disconnect. 6500 Joule Rating Provides a High Level of Surge Protection. Discrete filter sections for Analog Audio, Analog Video, High-Current Audio, and Digital components. Selectable Voltmeter / Ampmeter with Front-Panel Digital LED Display. 3 Sets of Coaxial Connections for Cable / Satellite TV. RJ-11 Telephone Input / Output with Splitter for DVR Phone Line or Internet Connection. 5-Year $500,000 connected equipment protection (covers equipment damaged by an AC power, cable, telephone or lighting surge while connected to properly installed Monster Cable surge protector). Limited 5 Year Warranty on the Monster Power HTS 3600 MKII power center. Brand New Item, with Full Factory Warranty In-stock and Ready to Ship.